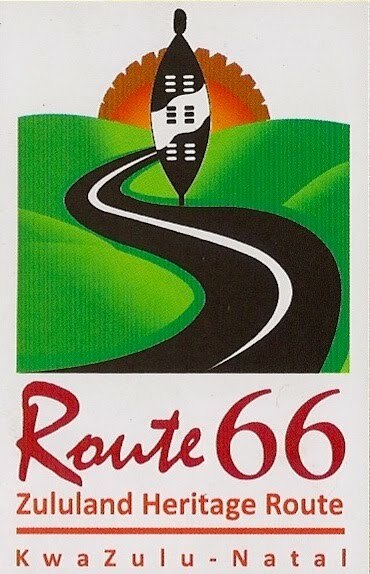 The R66 – Route 66 – between Gingindlovu and Phongolo follows one of the oldest trade routes through Zululand. Settlers resident at Port Natal in the early 19th Century would set off in oxwagons on well-worn tracks and cross into Zululand at a drift very close to the present N2 bridge over the Thukela River. The tracks followed the coast for a while before turning inland towards the heart of the Zulu Kingdom as settlers required the permission of the king before they could hunt and trade in his territory. The merchandise their wagons carried as they forded the Thukela River into Zululand included cotton and lambswool blankets, calico cloth, brass and copper wire, and coloured glass beads. Other commodities such as pick handles were not uncommon, and sometimes a gun or some gunpowder might be smuggled in to enhance profits. During their trips which would last up to three months, the traders hunted and bartered and on their return journey, if all went well, they would return to Port Natal with their wagons filled with ivory, buffalo and wildebeest skins, rhino horn, hippo teeth and hippo fat. Cat and monkey skins were also desirable commodities. Following in these same paths soon after them, in ever increasing numbers, were the missionaries and their families, transport riders, then soldiers, colonial administrators, police, settlers and farmers. The route has been witness to immense changes and terrible conflict – clan against clan and kingdom against kingdom. This is where Victorian Britain’s imperial ambitions and military might were shaken by the gallantry of ‘a remarkable people’ armed only with shields and spears. The wagon tracks have long since made way for a modern infrastructure but today’s visitors in their air-conditioned SUV’s, navigated by GPS, can still get a sense of how things used to be on Route 66. Many of its valleys once teeming with wild game, have been divided up into fertile farms but Zululand remains a place deeply rooted in its ancient traditions.